As you may see, it’s about tribes. There are a number of ethnicity-related problems and more than a few of religion-related troubles, but this is Libya. This is about having at your side as many tribes as possible and bribe or fight against the others. What Gheddafi was good at was keeping a form of equilibrium between tribes and a central authority that got a grip over the towns, a result obtained with a mix between the money he got from selling oil and the fear of armed retaliation against anybody who stepped out of control. Add to this cocktail decades of ambiguity with the western countries, the habit of keeping a finger into every criminal pie ever cooked in the Middle East and an immense cult of personality – that was Libya under Gheddafi’s rule. The end of such a regime was (and is) an example of the need of a strategy. Following the lead of one of the worst French leader ever, Mr. Sarkozy, a loose coalition of Western countries forced the end of Gheddafi without having a precise plan about the future of Libya. Without a central authority and in absence of adequate military force in place to keep the state machine running, the country devolved in a failed state in a matter of two years. So please, do not tell me that the problem is about IS. What happens in a failed state? Everything. As a matter of fact Libya is no more. We have no less than a dozen territories, dominated by one or more tribes with the support of units of the national army, each one actively busy to get as much money or local influence they can. Once again, it’s not about religion or ethnic reasons, it’s about money and power. That’s Libya today. 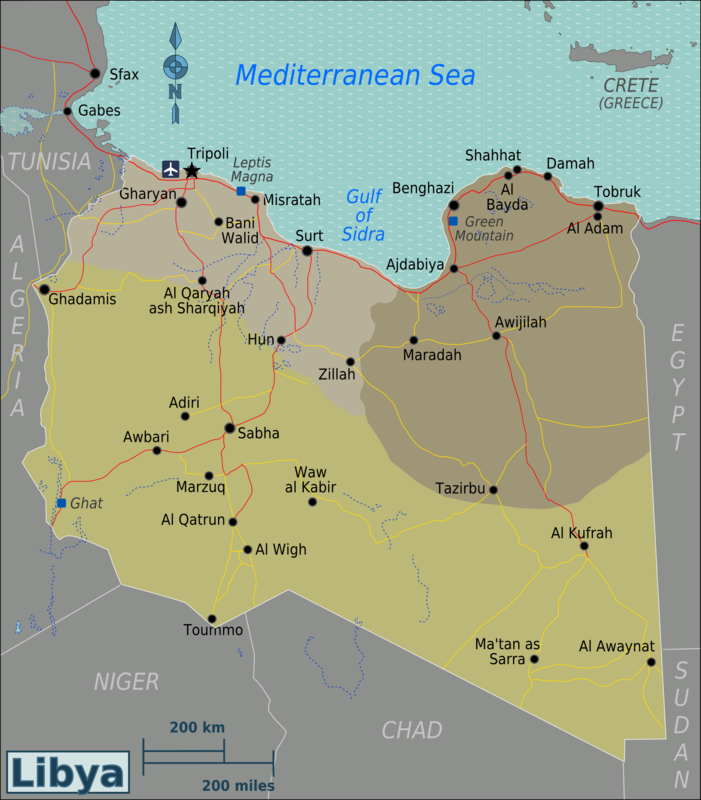 What keep the Western countries interested in Libya? Just three things: oil, human trafficking and the media attention about IS. Oil has become a minor factor, in the last few months we’re getting low prices for this commodity so a reduced output from Libya is a real problem only for the companies that invested in it (mostly ENI). Human trafficking is more a nuisance, mostly because the thousands of refugees that try every month to reach Italy give us one hell of a logistic problem to solve (again under media attention). IS posed as the villain of the day, the black-dressed foe that is popping up in all the crisis in the Arab countries. Crying for armed intervention now, to force IS out of Libya and/or to annihilate Jihaidism in that country, is understandable but basically stupid. Let’s take a step back and consider what happened in Somalia, Iraq, Afghanistan and in Libya. Under the hat of some UN resolution Western countries forced the end of a local regime, destroying any conventional opposition force that may be found in that places. So far, operational success. Then came the stabilization phase and we never, NEVER, achieve any kind of success doing this. We lose billions of dollars and a considerable amount of lives, not to mention the huge loss of civilians lives and property destruction. For what? Is there really anybody out there who thinks that’s the right way to solve problems? There’s no such thing as an easy solution at hand, nor a fast one. When a country become a failed state the only available path for a stabilization comes out from eroding the support of local population for conflict, in order to keep the various rebels organization busy about survival and not about fighting against each other or against Western targets. It’s a long-term strategy, the kind of effort that UK put in effect in Malaysia in the ’50s. That means a capability to sustain at a political level such a strategy, no matter who get to win the elections in the USA or in Europe. So the final question is: can we do that? (*) IS or ISIS or ISIL or Da’ish or DAESH… please, find a more stable name. Thank you. Putting “Italy”, “decency” and “foreign policy” in the same sentence is quite risky,isn’t it? With Libya, before and after Gheddafi, our country has been ambigous at best. We can still do a lot to help that country but without a real plan and without an international framework any proposal is void. Renzi doesn’t have any international prospective, nor his government is able to even understand the current situation. As always, we’re waiting for the big brother to show up and take the lead. They did like Leeroy Jenkins, and now we can see that all the chickens come home to roost. for the future please use the brain to think, not the balls. But is true that mr Gentiloni spoke about “we need to go and fight the evil”? Our not-so-bright Mr. Gentiloni did it. And add a lot of wishful thinking about future missions in Libya. Mrs. Pinotti follow suit in the same day, talking about some 5,000 men already allocated for the task. Then somebody give them their prescriptions and they finally shut up. Hi Angelo, have you any link or source about “the kind of effort that UK put in effect in Malaysia in the ’50s”?